This weekend thousands of kids will spend time dying Easter Eggs in the most brilliant of colors, a custom so ‘normal’ that most parents don’t give it second thought. And the ones that do often times make allowances for the fact that “it’s only the shell”, thinking that the dye and any chemicals contained in it stay on the outside. What I do know about eggs is that the shell are porous, meaning that what’s on the outside of the shell can make its way to the inside as well. And for this reason we’ve actually never bought the egg dying kits from the store. Instead we use simple ingredients out of out refrigerator and cupboards. Chop half of a head of red cabbage and place in a medium-sized pot. Cover with water and simmer for 20-30 minutes, strain and let cool. (you can also use blueberries, and we actually like to add 1/2 cup of blueberries to the pot along with the cabbage) Add your hardboiled eggs and 3 Tbsp white vinegar to the blue/purple water and let sit for at least 30 minutes for a light blue, overnight for deeper color. Simmer two cans of beets (with liquid from cans) with a cup of water for 20 minutes, strain and let cool. Add your hardboiled eggs and 3 Tbsp vinegar to the hot pink liquid and let sit 30 minutes for light pink, overnight for deeper color. Stir 3 Tbsp of chili powder into 2 cups hot water. Let cool and add 3 Tbsp white vinegar to the mix. 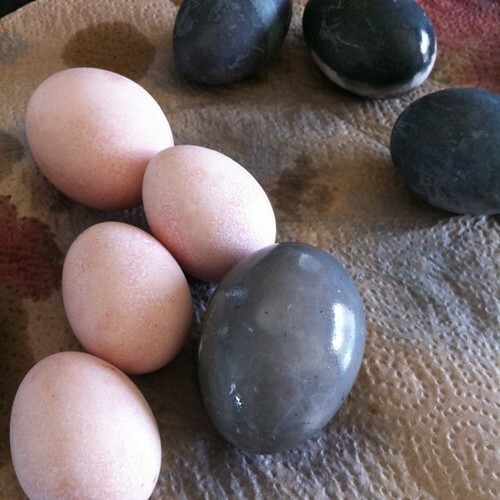 Place eggs in the jar/bowl and let sit for about and hour or overnight for more pronounced color. Use older eggs. There actually is a scientific reason (something or other about the membranes and oxygen coming in from the egg’s pores that pull it apart from the shell), but eggs that are about 2-3 weeks old will peel from the shell the easiest. The color of the egg matters! 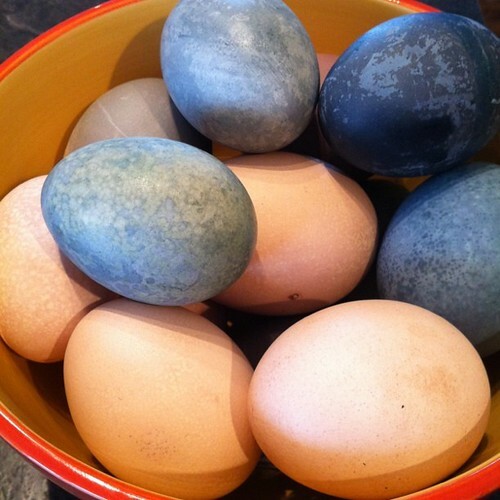 White eggs will produce brighter colors, brown eggs are a bit harder to dye and will be very “vintage-y”.We actually have a couple of hens called ‘Easter Eggers’ that lay light blue-ish-green eggs, which lent very well to the blue dye. Turn it into a fun experiment for kids. I know as a parent we want our kids to have the same fun experiences that we had and sometimes feel like we’re depriving them of “life” when we choose not to do what the majority of society does. While my kids have never done conventional Easter eggs, we had a great time guessing what colors would come from different foods and what colors the eggs would be. With older kids (or moms with more patience with 4 year olds than I have) can use strips of masking tape or leaves tied to the egg in tight cheesecloth to make fun designs and patterns. To give them a shine after they are dyed and dry, take a bit of oil and polish them up. This gives them a beautiful vintage shine. Totally didn’t know that about older eggs! Good thing to keep in mind. I hate it when the eggs won’t peel. Hi Donielle! I LOVE your tip about polishing the eggs with a little bit of oil. They are GEORGEOUS!!! We will definitely have to give that a try. Thanks! Very excited to share my photos with you! Thank you for the inspiration! I love running into this site, Thank YOU for the information ….I haven’t done this in eons. I have to try this again. You can Tea dye them too, just make tea with lots of strong tea in it and soak the eggs until you reach a color you like. Every tea gives off different colors. Fun! Thank you again. @Olinda Paul, I’ll have to try some teas next year – thanks for the tip!